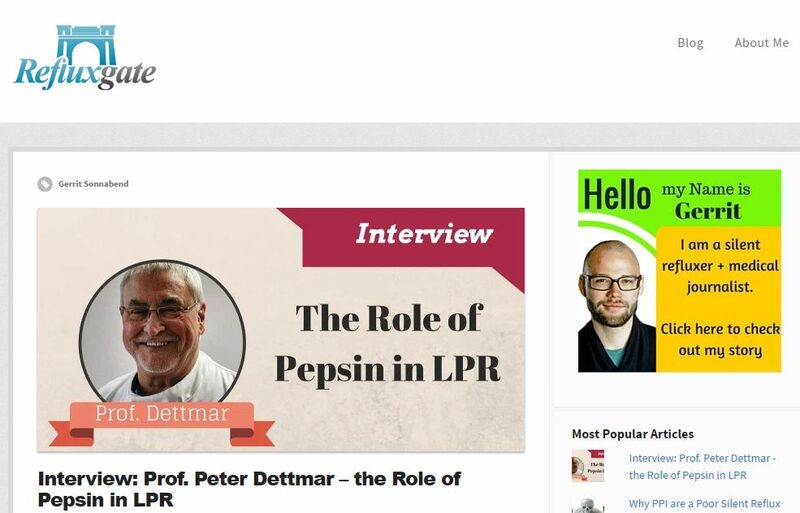 Peptest’s Professor Peter Dettmar is to feature in a four-part interview with the Refluxgate blog, which provides information on causes, diagnosis and treatment for Laryngopharangeal Reflux (LPR). Refluxgate.com is written by medical journalist Gerrit, who set up his helpful website after suffering from LPR, also known as silent reflux, for 10 years before he was diagnosed. In the first part of the interview series, Professor Peter Dettmar discusses how his studies with Dr Jamie Koufman found a correlation between the stomach enzyme pepsin and LPR; how pepsin can cause damage when you have reflux and how pepsin penetrates the cells in the airways. The next three parts of the interview, which will cover the topics of symptoms, diagnosis and treatment of LPR, will be published over the coming weeks.